Since the inception of the Asbestos Disease Awareness Organization (ADAO), U.S. Sen. Barbara Boxer has been the strongest champion asbestos victims could ask for. 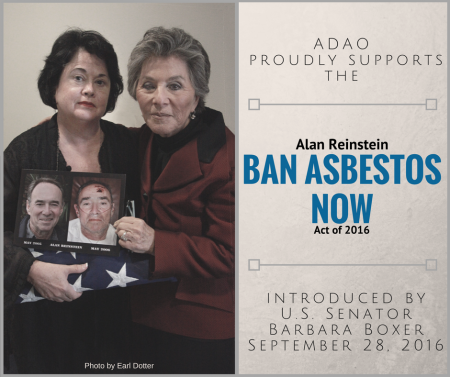 Today, she solidified this position by introducing the Alan Reinstein Ban Asbestos Now Act of 2016, with co-sponsorship from U.S. Sen. Jon Tester. If passed, this act would expedite a ban on asbestos imports and both existing and future uses. It would require the Environmental Protection Agency (EPA) to prohibit the manufacture, processing, use, distribution in commerce, and disposal of asbestos within 18 months of the bill’s enactment. This bill builds on the encouragement we felt this past summer, when the Frank R. Lautenberg Chemical Safety for the 21st Century Act (LSCA) was passed and signed into law by President Obama. LSCA gives the EPA the necessary regulatory authority to enact a ban on imports and future use of asbestos, but it also gives the Agency as long as 12 years to assess and regulate asbestos. While LCSA is a landmark step forward, The Alan Reinstein Ban Asbestos Now Act of 2016 will ensure the EPA can expeditiously ban asbestos in a fraction of the time. While we encourage Congress to support Sen. Boxer’s bill, we continue to urge the EPA to prioritize asbestos in its first ten high-risk chemicals evaluated under LCSA, ensuring swift regulation of this lethal toxin. Americans can’t afford to wait 7-12 more years to end the man-made asbestos disaster. As we in the ADAO community know, this is not the first attempt at federal legislation to enact or expedite an asbestos ban. Sen. Boxer introduced another ban bill bearing my late husband’s name in 2015. Though it did not pass last year, we are hopeful that this year’s bill will lead to meaningful conversations and ultimately, a swift ban on asbestos. Please join me in thanking Sens. Boxer and Tester, and in urging Congress to take this opportunity to show true dedication to protecting public health and our environment. This entry was posted in Blog and tagged ADAO, Alan Reinstein, Alan Reinstein Ban Asbestos Now Act of 2016, asbestos, Asbestos Disease Awareness Organization, asbestosis, ban asbestos, Barbara Boxer, Frank R. Lautenberg Chemical Safety for the 21st Century Act, Linda Reinstein, mesothelioma, Toxic Substances Control Act, TSCA, United States, US Senate. Bookmark the permalink.